Check why LMS User Experience matters for both front and back-end users. If you’re still wondering why usability should be at the top of your priority list, find here 8 notable advantages to consider. When vetting the LMS vendors, it’s wise to have a vocab cheat sheet at the ready in order to verify the software’s UX value. Let’s take a closer look at the main differences between the LMS User Experience and usability, as well as where the UI ts into the big picture. One of the most difficult and time-consuming aspects of LMS implementation is actually finding a system that meets your needs. Discover 9 key traits that all user-friendly LMS platforms have in common. Learn how to use LMS reviews and ratings to find the “ideal” Learning Management System, as well as the importance of its LMS Net Promoter Score. You don’t need to add even more ambiguity to the equation by implementing an LMS that is overly complex and requires vast IT knowledge. LMS perceived usefulness pertains to the impact the system has on a team member’s job performance or productivity. Improve your LMS User Experience and maximize online training benefits. Discover 7 LMS accessibility issues that signal it’s time to look for a replacement LMS. Does your LMS fulfill your business goals? Learn how to measure your LMS reliability. How to use an LMS online directory to select a user-friendly LMS that has all the features you need. Discover tips evaluate the LMS User Interface during your LMS demo and avoid buyer’s regret. Find a new, user-friendly LMS that works seamlessly with what you already have. Discover few functions that are must-haves when you’re thinking about LMS User Experience and overall usability. This free eBook summarizes all you need to know so you can select a new platform that offers the best LMS User Experience. Find out why LMS User Experience really matters, the differences between LMS User Experience and usability, the advantages of using an LMS that ranks high in usability terms, as well as the top quintessential traits of a user-friendly LMS. In addition, discover the importance of the Net Promoter Score, how to use LMS user reviews & ratings to find the ideal LMS, the importance of LMS Perceived usefulness and its impact on work performance and L&D ROI. Last but not least, learn about the advantages of using an LMS Online Directory to choose a user-friendly LMS, and how to evaluate the LMS User Interface during an LMS Demo or free trial. 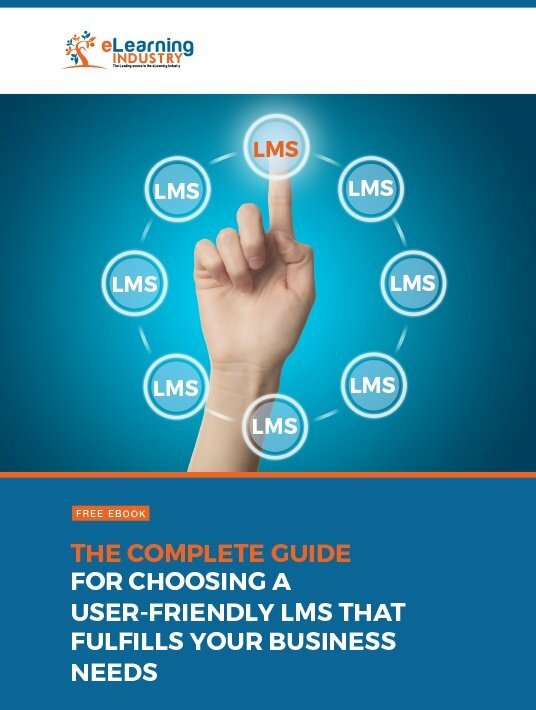 Download our Free eBook “The Complete Guide For Choosing A User-Friendly LMS That Fulfills Your Business Needs”. A useful tool for every eLearning professional. The last thing you need is an LMS that makes online training more stressful. Thus, you need to choose a system that offers the best LMS User Experience so that every member of your staff stays fully engaged instead of dreading the next online course due to an overly complicated UI or challenging navigation controls.